Yamaha launched updated FZ FI version 2.0 in India in 2014 wherein the motorcycle had undergone significant revisions all over. The highlight of this updates was the fuel injection which was part of the new Yamaha technology called Blue Core. This new tech claimed to offer lower fuel consumption, cut power loss and increase combustion efficiency. Now that four years have gone by since this update happened on the Yamaha FZ, we believe the Japanese motorcycle manufacturer is working on launching a new-gen FZ. And this is not just speculation as test mules of the same have already started doing rounds in the country. 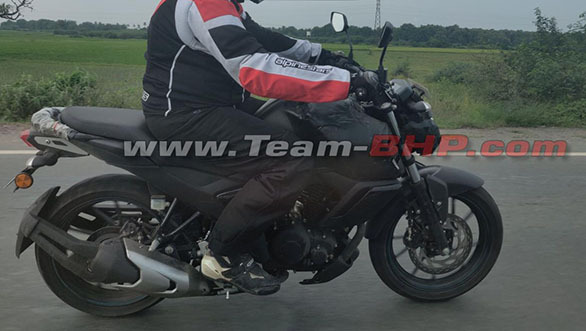 As seen from the images, it can be seen, the new-gen Yamaha FZ will feature a more muscular design with multiple contours. Something that we have already seen on Yamaha's latest offering, the R15 v3. The test motorcycles, though heavily camouflaged do reveal bits and pieces of the new design. For starters, the 2019 update features a LED headlight which should offer better illumination than the present setup. The fuel tank looks beefier than before. The tank extensions underneath look much larger than what's offered on the present offering. The other design changes include a belly pan, single seat, new alloy wheel design and an updated exhaust can. The 149.1cc fuel injected engine in the present form makes 13.1PS of power and 12.8Nm. These numbers might not be too impressive especially when you compare the FZ to its rivals like the TVS Apache RTR 160 4V and the Honda CB Hornet 160R. However, the new-gen update might also see a bump in the power and torque outputs. Would you want Yamaha to make the 2019 FZ FI more powerful? Let us know in the comments section below.